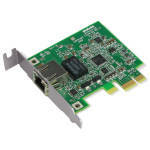 The Matrox Concord GigE network Interface card includes a GigE run-time license for Matrox MIL and MIL LITE software development kits. Design Assistant (DA) is a flow-chart based integrated development environment. Capture from any GigE Vision or USB3 Vision compliant camera. Manipulate and analyze images to make pass/fail decisions, then exchange data with a PLC or robot. Due to the manufacturer's policies, orders cannot be cancelled once they have been confirmed by the factory. Returns will not be accepted unless the item is defective under warranty.